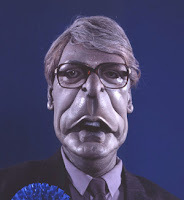 Being an astute and erudite resident of Worcester Park (I'm afraid if you don't know what those two words mean then that automatically disqualifies you from being one) you will of course already know that former Prime Minister John Major was a one-time resident of Worcester Park. What you might not know, however, is that we were nearly robbed of (or should that be spared?) our future Prime Minister when a V1 fell on Worcester Park in 1944. I have already related the tale of the V1 strike on Caldbeck Avenue in this earlier blog post. The bomb fell near the junction of Browning Avenue, just behind the Major-Ball's home in Longfellow Road. On the evening that it fell, the young John Major-Ball had been asleep in his cot in the front room of the family home, but just moments before the V1 fell, his mother lifted him from the cot and carried him into the hall. As the bomb struck in Caldbeck Avenue, the windows of the Major-Ball's front room were shattered by the force of the blast, and the young John Major's empty cot was speared by shards of glass.